We’d love your help. 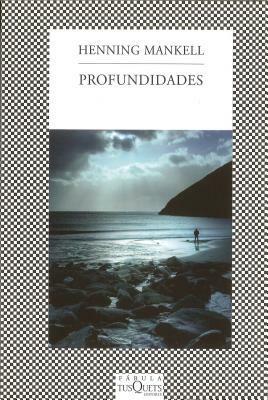 Let us know what’s wrong with this preview of Profundidades by Henning Mankell. To ask other readers questions about Profundidades, please sign up. The shittiest, most depressing book I've yet stumbled across. People refer to their frustration with a book by saying they threw the book across the room. I don't think anyone really does that except.... with this book I did. Hard. Far. We are to have empathy for someone who has none, enjoy reading about a sociopath and his objectification of other people for what personal gain for ourselves? After reading, I think, every book by Henning Mankell (except the last Kurt Wallander) I question Mankell The shittiest, most depressing book I've yet stumbled across. People refer to their frustration with a book by saying they threw the book across the room. I don't think anyone really does that except.... with this book I did. Hard. Far. We are to have empathy for someone who has none, enjoy reading about a sociopath and his objectification of other people for what personal gain for ourselves? After reading, I think, every book by Henning Mankell (except the last Kurt Wallander) I question Mankell's mental health. I have not the words to describe just how much I disliked this book. The main character is so unremittingly horrible, so entirely devoid of any worth, that it is difficult to find anything positive in reading of his experiences. The prose is nothing special, the story unremarkable, and the only character of note so hideous that it is difficult to comment on anything else. For whatever reason I read it to the end, thinking perhaps something would change, but it did not, and the main character only g I have not the words to describe just how much I disliked this book. For whatever reason I read it to the end, thinking perhaps something would change, but it did not, and the main character only grew more repulsive as the book progressed. I really love Mankell's Swedish Detective Kurt Wallander series. So with no new translations due for awhile, I decided to give one of his non-Wallander books a try. On a positive note, I can now say that I know more than I ever thought possible about making depth soundings in the Stockholm archipelago. I can only hope that knowledge comes in handy at some point in my life, otherwise I have lost about 6 hours of my life for naught. page 120: "There is repression here - menacing repression." page 180: "repression has turned to obsession and stalking"
Hey, I really liked this book. Nice to read something else by Mankell that is not a Kurt Wallander "Mystery" I guess what I have always found appealing about the Wallander series is that they are less about "whodunnit" and more about the daily grind of life and life crisis. It is almost like the detective cases take a back seat to family deaths, when to scheldule the laundry room, divorce, diabetes, failed love etc. Kind of like the Hank Moseley series by Charles Willeford. Depths is a little bi Hey, I really liked this book. Nice to read something else by Mankell that is not a Kurt Wallander "Mystery" I guess what I have always found appealing about the Wallander series is that they are less about "whodunnit" and more about the daily grind of life and life crisis. It is almost like the detective cases take a back seat to family deaths, when to scheldule the laundry room, divorce, diabetes, failed love etc. Kind of like the Hank Moseley series by Charles Willeford. This novel will haunt me forever; it was, quite simply, a masterpiece. Occasionally, you read a novel so vivid and compelling that you almost feel as if you have experienced it rather than having just merely read it; this is one such example. Maybe this is because the author so deftly gets you inside the head of the psychopathic main character; a man obsessed with assessing distances and measuring sea depths. He is also a man who does not know his own mind, who cannot measure his own depths so t This novel will haunt me forever; it was, quite simply, a masterpiece. Occasionally, you read a novel so vivid and compelling that you almost feel as if you have experienced it rather than having just merely read it; this is one such example. Maybe this is because the author so deftly gets you inside the head of the psychopathic main character; a man obsessed with assessing distances and measuring sea depths. He is also a man who does not know his own mind, who cannot measure his own depths so to speak, but who knows there are dark, deep places, neither he nor anyone he encounters will ever be able to fathom. The prose is crisp and precise, and helps maintain a swift and exciting pace to the story. The setting is unusual: Sweden at the beginning of WW1. The landscape and seascape are beautifully and skillfully portrayed. The attention to detail, in all matters, makes the storyline, no matter how unfamiliar the setting may seem, especially to a non-Swedish reader, seem totally realistic and plausible. Maybe one day I will write a longer summary of my thoughts on this book, but would just like to finish by saying how astonished, and, yes, disappointed, I was reading some of the other comments I’ve read here on Goodreads about this book. I expected to see praise heaped upon it to the point of hyperbole, but instead I see, in some cases, what I can only describe as a superficial and immature dismissal of what is in essence a brilliant book. For example, not liking the book because the main character is “not likable” is absurd. Even if he is “not likable”, it is still possible to empathize, or at least identify, with certain aspects of his character. For example, the way he often changes his mind, or makes a decision, then regrets it and attempts to extricate himself from a predicament he once thought he wanted to be in but now doesn’t is something with which we can all identify. The author has shown extreme insightfulness into the human condition by bringing such things into a novel so successfully to the point that it is almost Shakespearean. I finished reading the book. This is one of the books I've been reading for years. I bought and and started reading it two, or even three years ago. At last, I settled myself to finish it, and I did. The book is quite true to its name in many ways. Not least because of the way it is written I felt I was drowining in slow and deep waves. The prose is very sparse. The chapters are often one page long - and most often two pages long (there are 403 pages split up into 206 chapters). At first the atm I finished reading the book. This is one of the books I've been reading for years. I bought and and started reading it two, or even three years ago. At last, I settled myself to finish it, and I did. The book is quite true to its name in many ways. Not least because of the way it is written I felt I was drowining in slow and deep waves. The prose is very sparse. The chapters are often one page long - and most often two pages long (there are 403 pages split up into 206 chapters). At first the atmosphere in the book is palpably heavy, extremely regulated and punctual, however later it becomes more oppressing and frenetic as the protagonist's fall (or drowning) into the depths of his own soul intensify. Depending on your mood you might find the book too long, and too full of symbolic phrases, however I tend to like these things. I would call the book slow-paced and very meditative. Throughout the book there is a poetic-like feeling to the text. The protagonist, if he may be called so, is a very unusual one. He is by far not a nice person, but sertainly a memorable one. As the pace of events quickens the reader watches protagonist's desperate and unstoppable decline with an increasing fascination combined with a growing disgust. This is not a book for many, however it is a worthy book to read. An exploration and to a certain degree measurement not only of the protagonist's depths, but a cause to measure our own.. It is October 1914, and Swedish naval officer Lars Tobiasson-Svartman is charged with a secret mission to take depth readings around the Stockholm archipelago. In the course of his work, he lands on the rocky isle of Halsskär. It seems impossible for it to be habitable, yet it is home to the young widow Sara Fredrika, who lives in near-total isolation and is unaware that the world is at war. The book is as sad and lonely as the island it depicts. Island of chance encounters, island of hope, island of peace, island of illicit despair, and eventually island of madness. I found this book interesting, obviously because of the island in it bore an uncanny resemblance to my own. But an excellent, excellent novel. This book is chilling.....I am almost sorry i read it. The main character is not sympathetic in any sense of the word. I don't think I shake the impression of awfulness that he imparted. Lars Tobiasson-Svartman is a meticulous Swedish naval officer, a hydrologist who instinctively and perhaps compulsively thinks in terms of measurement. There is an almost comical side to his insistent quest for precision and rationality, as when he sleeps with his sounding lead clutched to his chest like a teddy bear. It gradually becomes apparent however that there is something dark and foreboding about this clutching to the rational, and as the novel progresses he becomes increasingly unglued. Lars Tobiasson-Svartman is a meticulous Swedish naval officer, a hydrologist who instinctively and perhaps compulsively thinks in terms of measurement. There is an almost comical side to his insistent quest for precision and rationality, as when he sleeps with his sounding lead clutched to his chest like a teddy bear. It gradually becomes apparent however that there is something dark and foreboding about this clutching to the rational, and as the novel progresses he becomes increasingly unglued. I found him a fascinating character. He is not soul-less or insensitive; far from it. He is acutely observant of other people and of his own inner state of mind. His failure to understand his fellow man is deeply troubling to him. He is sensitive to the larger world, its sights, smells, even vibrations. He wants very much to understand, and he is very aware of his divided self. Ein beklemmendes Buch, nicht der typische 'Wallander-Mankell'. Es ist der Blick in die Tiefen einer Seele und der (Lebens-)Kampf des Mannes, der versucht, dort einen festen Grund zu finden. This is the story of a Swedish naval officer in the early 1900s who has become obsessed with measurements and his own kind of logic. And it's this Obsession that leads him into a kind of Madness. The first part of the book went faster than the last. Towards the end I just wanted to get it over with. I like the author's Wallander stories more. I'm looking forward to reading more Mysteries by Mankell. Lars Tobiasson-Svartman, measurer of ocean depths, charting the seas around the Swedish archipelago with a sounding lead and rope, on a secret mission for the Swedish navy, 1914, the days before sonar. Autumn. The arrival of winter. Frozen seas. Fog. Islands connected by ice. The holes through which the sea breathes. The silence. Ostergotland. Norrkoping. Valdermarsvik. Graholmarna. Krakmaro. Hokbadan. Halsskar. A journey across distances. And into madness. "His earliest memories were to do with me Lars Tobiasson-Svartman, measurer of ocean depths, charting the seas around the Swedish archipelago with a sounding lead and rope, on a secret mission for the Swedish navy, 1914, the days before sonar. "His earliest memories were to do with measurements. Between himself and his mother, his mother and his father, between the floor and the ceiling, between sorrow and joy. His whole life was made up of distances, measuring, abbreviating or extending them. He was a solitary person constantly seeking new distances to estimate or measure. Measuring distances was a sort of ritual, his personal means of reining in the movements of time and space. out navigable channels, discovers a solitary woman living alone on an island. His sexual obsession with this woman leads him into a series of dangerous lies or fantasies which eventually take over his life. There are murders, there is blood, but what stays with me is the evocation of a spiritual landscape... the Baltic sea frozen over in winter, and what lies beneath the ice. Didn't finish, so I can't rightfully do the star thing. As a Stockholm lover and lover of melancholy, loner characters, I was very surprised not to be able to make myself finish this book before its Interlibrary Loan due date (no renewals, guess that made my decision for me). I didn't care about a single character in the book. The best "character" in the book was the Swedish winter. A review on the back of the book praised it for exploring how a lonely individual can go bad. (I wish I wrote down t Didn't finish, so I can't rightfully do the star thing. Not a Kurt Wallander mystery. That said, Depths is an arresting, disquiting story of obsession. The main character Lars adds Tobiasson to Svartman (tobiasson-Svartman) to create a softness in his name (his mother's maiden name). He is a military man of extreme precision who measures for a living. Set in neutral Sweden during WWI, Lars is ordered to remeasure ocean depths to find quicker, safer passages for military ships. Men die in his presence, often enough to create suspician, though he did n Not a Kurt Wallander mystery. That said, Depths is an arresting, disquiting story of obsession. The main character Lars adds Tobiasson to Svartman (tobiasson-Svartman) to create a softness in his name (his mother's maiden name). He is a military man of extreme precision who measures for a living. Set in neutral Sweden during WWI, Lars is ordered to remeasure ocean depths to find quicker, safer passages for military ships. Men die in his presence, often enough to create suspician, though he did not initially commit murder. He is secretive and lies, even to himself. He does not know himself. He realizes he has been measuring himself throughout his life. The book is fascinating and dark; even the cover is shades of gray. This has got to be one of the most bizarre novels I have ever read. Mankell is great at creating unlikable characters, but he has really taken the prize with his depiction of the Swedish Naval Officer, Lars Tobiasson-Svartman. The books starts out innocuously but then gradually develops into a creepy story of a truly evil man who manages to lure two women into his sick life, impregnate them and then ruin their lives. Only recommend it if you like weird,sick stories. Impossible to put down. The main character is utterly believable and his inner monologues brilliant. I loved him finding the diary - a first glimpse into his psychopathic personality. The book, after a slow burning start, got better and better and became real nail-biting stuff. This is the only Henning Mankell book I haven't enjoyed. The plot goes round in repetetive circles and is so depressing, and the characters are depressing and uninteresting. I hoped that the naval battles of the 1st World War would play some significance but it was mentioned only peripherally. Very disappointing. I have liked all of Mankell's books and I am a big fan of the Wallander series, but this book was one of the worst things I have read in some time. The protagonist had no redeeming qualities and was truly an a morale person. I would not suggest this as a book to read for anyone I like.